When rockabilly and burlesque collide, mutually weird and wonderful chemistry ignites. 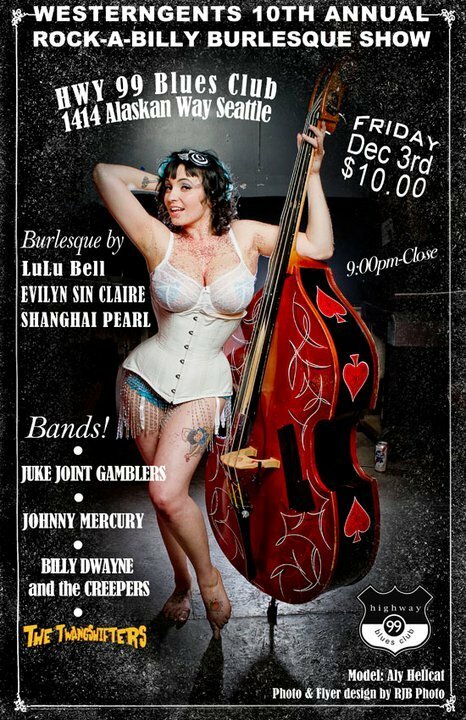 Tonight Evilyn Sin Claire and The Shanghai Pearl-two of my all-time favorite Seattle burlesque performers- moonlight with LuLu Bell at Hwy 99 Blues Club for Westerngents 10th Annual Rockabilly Burlesque Show. A ten year love affair deserves to be celebrated. ~ by angrytruffle on 12/03/2010.